Let someone special know you care, and make a difference in the community with Jewish Federation of South Palm Beach Tribute Cards. We offer a variety of tribute cards to commemorate special occasions, significant events, and Jewish holidays. Each card includes a meaningful quote from Jewish tradition and is personalized with the names of the recipient and the giver. Tribute cards are the perfect way to honor a loved one and strengthen the community at the same time. We offer two convenient ways to let your friends and relatives know you're thinking of them. Why is an ecard better? Recipient(s) will receive your tribute immediately. Over 6 ecards to choose from, it's environmentally friendly, and will lower costs to our organization. To get started - click on the occasion below. The text below shows the default message that will be sent, but you can also add a personalized message just from you. Click on the type of card below to go to the next step. 2. Printed Tribute Card - click here to get started. Get Well Wishes. A tribute has been made in your honor to the Jewish Federation of South Palm Beach County. Happy Birthday. 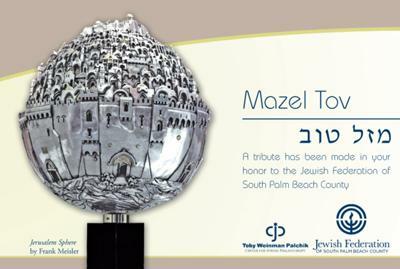 A tribute has been made in your honor to the Jewish Federation of South Palm Beach County. In Celebration. 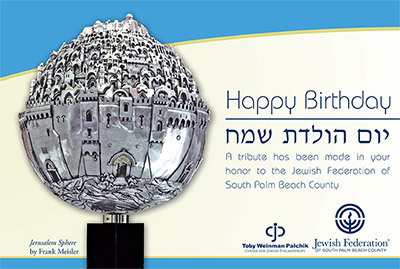 A tribute has been made in your honor to the Jewish Federation of South Palm Beach County. In Honor of ___. 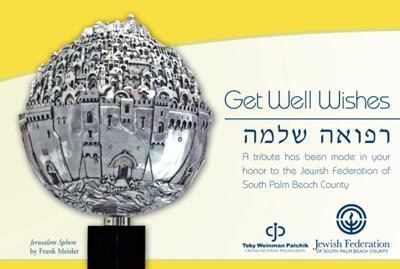 A tribute has been made in your honor to the Jewish Federation of South Palm Beach County. In Memory of ___. A tribute has been made in your honor to the Jewish Federation of South Palm Beach County. Mazel Tov! A tribute has been made in your honor to the Jewish Federation of South Palm Beach County.